Educational Consultant Lisa Wax gives some great ideas to encourage boys to read. Boys have different interests than girls and therefore if you want them to read, give them reading material on topics that interest them. 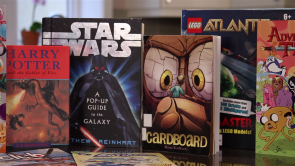 Magazines, comics and graphic novels are great options for boys. Boys also tend to enjoy on-fiction books on topics that they love like dinosaurs, cars or trains. Harry Potter books are extremely popular with boys and girls alike and is a good series to introduce once they are old enough.